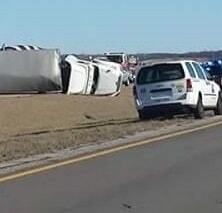 Truck overturns on U.S. 30; Do you have photos of wind damage? GALION — North central Ohio’s wacky weather continues. High winds brought down tree limbs on Wednesday and disrupted electric, satellite, phone and cable service in this part of the state. But no serious damage was reported. The wind managed to turn over a semi-trailer on U.S 30 between Ohio 602 and County Road 330A near Bucyrus, which did disrupt traffic in the area. According to the Crawford County Sheriff’s Office, the rollover accident resulted in no injures. A Freightliner driven by James Bohland of North Royalton, and pulling a 53-foot box trailer containing a small volume of mail, was lifted in the wind by the heavy wind and deposited on its side. Both the semi and and trailed ended up the passenger side, completely blocking both westbound lanes on U.S. 30. Traffic was detoured at Ohio 602 until the scene was clear. Emergency assistance was provided by Whetstone Township Volunteer Fire Department, Life Support Team and the Ohio Department of Transportation. The vehicle was removed from the scene by Bloomfield Towing and Knecht’s Auto Recycling. If you have photos of trees or limbs down or damage or anything out of the ordinary caused by Wednesday’s wind, and are willing to share them, please email Russ Kent at rkent@civitasmedia.com. If I get enough photos I’ll put together a photo gallery for our website (galioninquirer.com) and Facebook page. The National Weather Service in Cleveland is predicting 1 t0 3 inches of snow tonight in this part of Ohio. Temperatures will rise to about 50 this afternoon, and then start to drop to a low of about 27 Friday morning. Precipitation could start as rain early in this evening and turn to snow around 10 p.m., according to the website weather.com. Friday night will be chilly, with the temperature dropping to early Saturday, nd it may not get above freezing until Sunday afternoon. Seasonal temperatures — and perhaps a little cooler than average — are expected through midweek.